REportfolio™ is a complete software solution for the management and administration of diverse property and asset portfolios, including multiple leased, owned, and revenue-generating properties. Forecast occupancy costs, track and report payments and receivables, and be reminded of critical lease dates as they are approaching. Track owned and leased site information, office and land leases, permits, easements, equipment leases, plus any number of agreement types. Reduce costs and risks through clear and accurate financial visibility. In addition, REportfolio™ JOBS helps you track, monitor, and report on the status of all workgroup portfolio transactions. A centralized database of all sites, properties, locations, and related information—find, sort, and report a list of any property or agreement you want in only a few clicks. Manage multiple types of agreements at each location—leases, subleases, ground/land leases, permits, easements, rights-of-entry, and equipment leases. Handle financial forecasting and reporting in US dollars or foreign currencies. Manage properties and agreements in square feet, square meters, or acres. Prepare monthly reports, ledgers of payments, or tenant/lessee invoices. Allocate costs or revenues to your own accounting codes. Attach and manage an unlimited number of documents to agreement records. Be reminded of approaching critical portfolio dates—by on-screen alerts, automated scheduled emails, or on-demand reports. REportfolio™ JOBS helps you track, monitor, and report on the status of all workgroup portfolio transactions. Keep all tenants, landlords, contacts, and contact info in a central location. Easily enter and track agreement information related to insurance policies, storage, parking, headcount/area allocation, and security deposits. Hundreds of off-the-shelf, pre-formatted, consistent, and professional reports. Reports are available for a single property or agreement, a set of records based on your own criteria, or executive-level summaries of data by any number of categories. Reports include cost and revenue forecasting, rent rolls, lease and agreement abstracts, straight-line accounting, tenant invoices, statements, and aging accounts receivable reports, just to name a few. Easily build and deploy new reports on your own. Reports can be sent to your printer, generated as a PDF, or a direct Excel output. Reports can be scheduled in advance to be automatically triggered or sent on a regular basis (weekly, monthly, etc.) to designated individuals or teams. Available Audit Trail module records a detailed granular history of all system data created, edited, and modified by all users. The Wizard Software Enterprise Simple Portal™ can streamline the process of reconciling REportfolio™ with ERP data from systems like Oracle, PeopleSoft, Lawson, and SAP. REportfolio Go™ web-based and mobile application interface for real estate executives and administrators. Instantly publish portfolio information to a department website for executives, owner-users, and stakeholders. – S. Taylor, City of San Diego Real Estate Records Supervisor. Either now or down the road, our solutions can meet all of your Integrated Workplace Management System (IWMS) needs. You have the choice between cloud-based and on-premise solutions, empowering you and your IT department to decide where your data resides and how it's accessed. 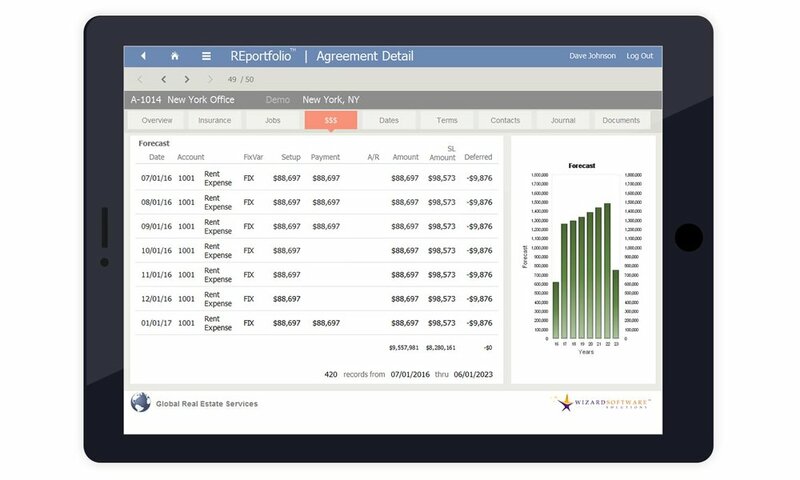 As a web-based or mobile application, REportfolio™ ensures the information you need is always at hand, including your real estate locations’ financials, critical dates, legal terms, contacts, and more. REportfolio™ can work independently or provide the foundation of leased and owned real estate locations for Performo™ and Projecto™.